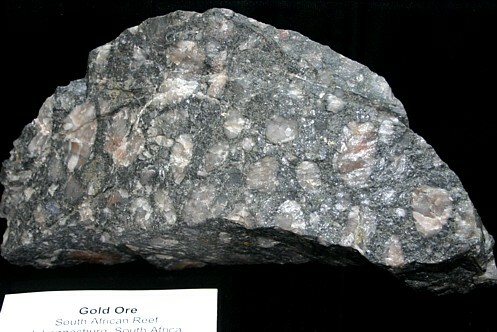 Gold and silver are obtained from a variety of ores. Most people think of nuggets and such, but the truth is that very little comes from nuggets - nearly all newly mined gold comes from ores mined from the natural hard rocks that contain gold in tiny, even microscopic particles. This webpage is created to show what some of those ores look like. Gold is found widely diffused in nature even though it is one of the scarcer metals. 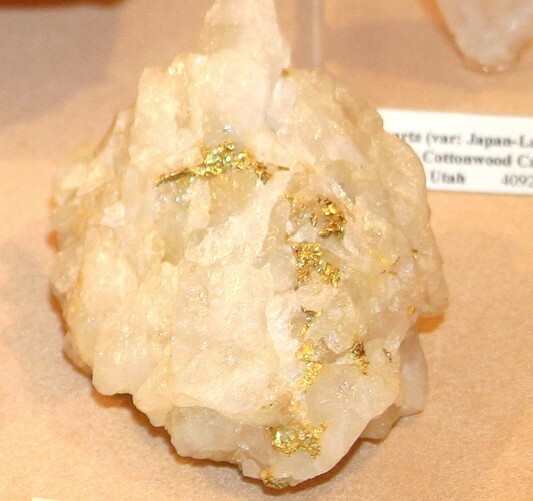 Very commonly, gold occurs as the native metal encased within quartz. 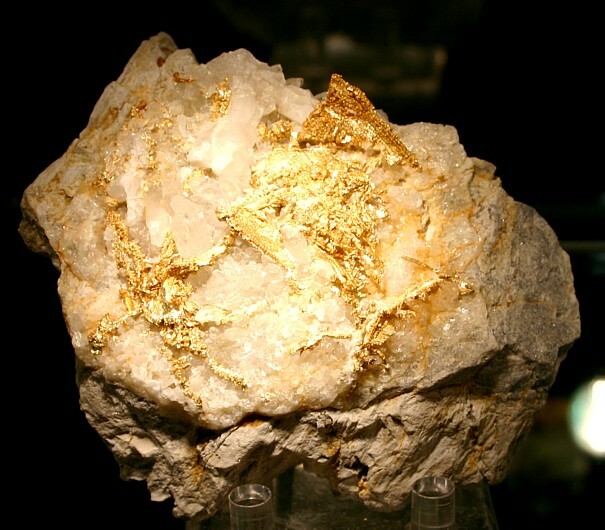 Sometimes the gold is in a finely divided state, sometimes in particles of considerable size, as nuggets, grains, scales, plates, threads and wires in quartz rock. It occurs also in a finely divided state disseminated through schistose rocks, slates and some sedimentary rocks like limestone. In these cases the rock has been altered by the flow of heated and mineralized waters, often resulting in the impregnation of large amounts of rock with silica and iron. Sometimes the silicified rock even replaces the original country rock. While historically speaking vein deposits were the most productive, these disseminated deposits currently yield much of the worlds gold ore. Within gold ores, the element occurs in nature chiefly as native gold, which is by far the most common gold bearing mineral. In various gold ores, the native gold commonly occurs as tiny particles contained within sulfide minerals such as pyrite. Iron pyrite is an exceedingly common associate with gold, but it also serves as a reducing agent. Therefore whenever gold is found encased in pyrite, it is always present as free gold and not as some type of gold sulphide. Gold is also found at times in chalcopyrite, galena and arsenopyrite and stibnite, but not as a rule in such large amounts as may be found in pyrite. Other minerals, like sphalerite, pyrrhotite, magnetite and hematite sometimes carry small amounts of gold as well. Gold also occurs as tellurides such as calaverite. Common gangue minerals in gold ores include quartz, fluorite, calcite and pyrite, but many others can be found in smaller amounts. This piece of gold ore does not look very spectacular, but millions of tons of this material have revolutionized gold mining across the world. It is a sediment hosted bulk gold deposit. 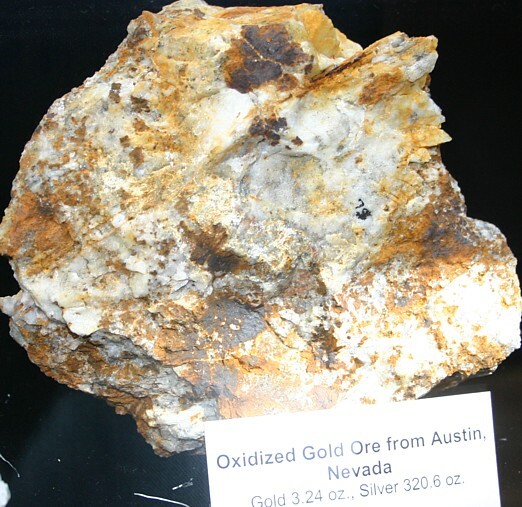 This gold ore is typical of a great series of deposits extending north and south from near Carlin, Nevada have yielded millions of ounces of gold. Over the last 50 years, this district has become the most productive gold district in the US, producing over 60 million ounces of gold to date. The ore consists of silicified rock that often was originally some sort of limy shale. In some places the silicification is sufficient that the rock is known as jasperiod. Much of the material is low grade, but there is some material is high (over an ounce per ton) in grade. Barrick and Newmont control the most important properties in the area. These are crystals of Calaverite - a gold, silver and tellurium mineral. This is very high grade gold ore from the Cripple Creek district in Colorado. Many old time miners mistook this type of mineral for low grade sulfides, but this silvery metallic material probably is 40 percent gold by weight. Tellurides are often associated with rich ore - and that was true at Cripple Creek as it was elsewhere. This is a piece of gold ore from the famous Witwatersrand gold deposits of South Africa. The ore consists of conglomerate pebbles mostly of quartz, in a sandy matrix, with abundant pyrite in the cement. The gold, which occurs in the cement but not in the pebbles, is closely connected with the pyrite and is not visible to the naked eye. It is generally agreed that this auriferous conglomerate represents an ancient placer, although the gold and pyrite have been re-disolved and moved around or recrystalized after emplacement. Most geologists see these ores as fossilized placer deposits altered by heat and water flows. The auriferous conglomerates of the Johannesburg district of South Africa, are of apparently simple structure. The Witwatersrand system consists of slates, quartzites, and conglomerates, aggregating 19,000 feet in thickness, which are overlain in turn by the Ventersdorp system of volcanics. The Witwatersrand, which is probably of Cambrian or pre-Cambrian age, forms a syncline with Johannesburg on its north side. The series has been faulted and also cut by diabase dikes, and while gold bearing conglomerates are found at several different horizons, the most productive ones are in the upper part. Small bits of gold are scattered through this piece of mesothermal vein quartz from the mother lode region of California. The gold is mostly concentrated around the edges of dark colored spots of iron oxide that were likely originally clots of pyrite. This is very rich gold ore. This small but rich specimen slab is from a narrow quartz vein found in Russia. Native gold runs down the center line. This chunk of vein quartz from Mariposa is typical of gold-quartz material from the mother lode district of California. In most gold ore, the gold is present in tiny specs, either within minerals like pyrite, or spread out free among the quartz. Normally even good, rich gold ore has no gold metal which is visible to the naked eye. The photo at left shows small particles of metallic gold in quartz taken from the mountains of Canada. 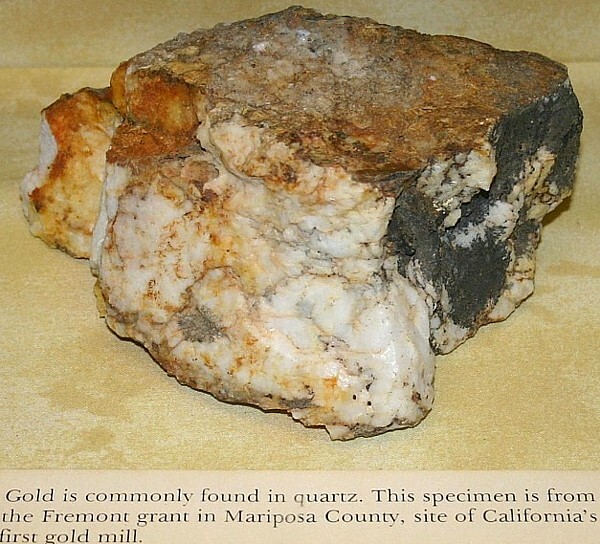 Sections of gray colored quartz in the specimen have this appearance because of the finely disbursed sulfide crystals present in this ore.
Gold does not commonly combine with other elements, but there are exceptions. These are the telluride minerals such as Calaverite. This very rich gold ore specimen came from the El Paso gold mine in the Cripple Creek district in Colorado. Here is a small gold-quartz stringer that was cut through by a core drill during exploration. This core shows coarse crystalline gold near the wall of the small veinlet. 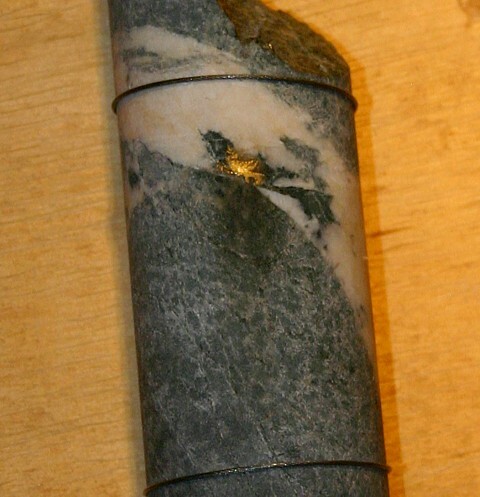 This specimen was drilled at the Kensington mine property in Alaska. Here is yet another beautiful gold piece from the big mine at Round Mountain. 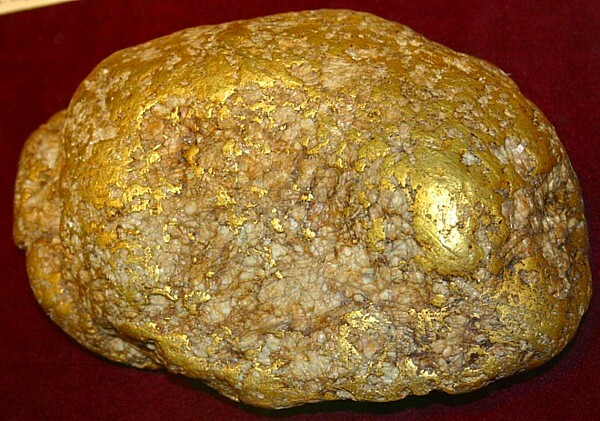 The gold is formed in a mossy crystalline pattern on the surface of the rock. The bulk of the ore which comes from his mine, produces gold only in tiny microscopic particles. Only a very small percentage of the gold occurs in visible pieces like this. This very large nugget gold specimen contains significant quartz and is from Alaska. It's rounded shape shows the signs of wear and tumbling in a river environment. The most prominent is native gold - most of the native gold contains a small amount of silver, copper, platinum, etc. Telluride minerals are the most common minerals which contain significant gold in their make up. They include: Petzite (Ag,Au) 2,Te, with a gold content of about 25 per cent. 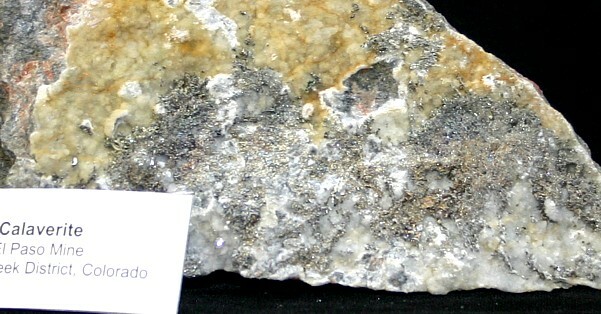 Hessite (Ag2Te), with gold often present replacing a part of the silver. Sylvanite (Au,Ag)Te2 : typically about 25 per cent. gold. Calaverite (Au,Ag)Te2 : typically about 40 per cent, gold. Krennerite (Ag2Te,Au2Te3) : gold is about 35 percent. Nagyagite (Au2,Pbi4,Sb3,Te7,S7). Some samples of Nagyagite have given upon analysis 12.75 per cent gold. The gold containing sulphides, as well as the tellurides, are of primary formation, although auriferous chalcopyrite might also be formed by secondary enrichment processes. Native gold may occur in the primary, secondary enrichment, or oxidized zones. 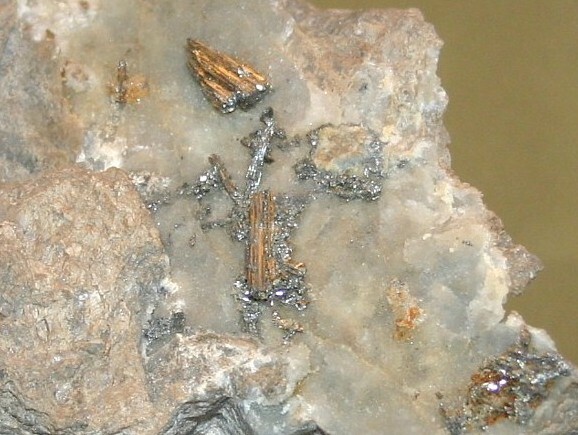 The tellurides, which are usually associated with pyrite, are widely distributed, though not so abundant, but not always recognized; indeed by some miners they are mistaken for sulfides. 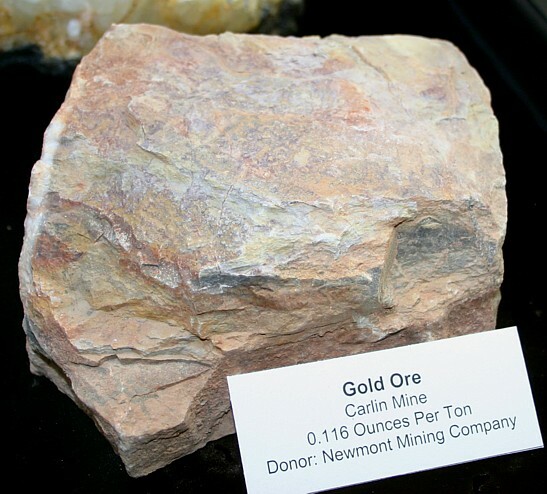 For more information see: minerals associated with gold ores. Gold deposits are often classified according to their association. The first of these may be catalogued as quartzose. This implies that the gangue mineral is acid, that is, quartz, and that fluorite may abound, or even the other gangue minerals of the alkaline earth group. Not infrequently there appears within the quartz varying amounts of pyrite and even limited quantities of ,chalcopyrite and galena. These are free milling ores. By a free milling ore is meant one that does not require roasting before amalgamation will take place. Dry ore is the term often used. The second class of gold ores is auriferous copper ores. These are widely distributed throughout the United States and much of the chalcopyrite is gold bearing. These auriferous copper ores are especially abundant in Colorado, Utah, Montana and British Columbia. Also at Gold Hill, North Carolina and in Newfoundland. 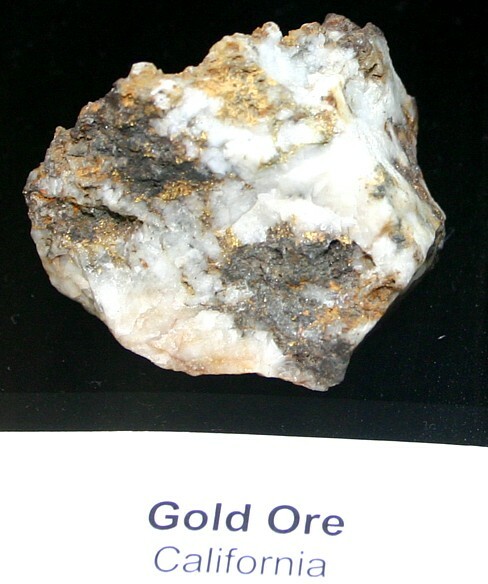 The third class of gold ore is auriferous lead ores. The percentage of lead is large and the gold content often small. They are refractory ores like the copper ores. By refractory ore is meant one that requires roasting before amalgamation will take place. The heavy sulfides as copper, lead and antimony require this method of treatment, that is the condition of the gold in the mineral will not allow of its immediate union with mercury upon the amalgamation plates. The fourth class of gold ores comprises the gold-telluride group. The gold telluride ores occur with silver, or with silver, lead and antimony, or as native gold accompanied by other tellurides. These ores are often sent direct to the smelters for treatment. A fifth type is the disseminated ore type. They are often low in grade but large. They fill large fracture and fault zones or replace certain geologic horizons. They are the result of the circulation of large amounts of heated water deep underground. A very common occurrence of gold ore is in true fissure veins, even and perhaps more abundant, in seams or layers in close proximity to the hanging wall, occasionally migrating across the fissure vein and then in close proximity to the footwall. Fissure veins often fluctuate greatly in value, so that the ore richest in gold occurs in pockets, or "bonanzas" as the miner says. In some mining belts one may by systematic drifting along the direction of the main fissure vein encounter a gold ore "bonanza." Where the normal concentration or value through the vein might be less than a quarter ounce of gold per ton of ore, a pocket might be represented by a ore with a richness of more than 1000 ounces per ton. It often occurs that drifting along the line of the vein must be carried for thousands of feet in low grade ore that does not pay for the extraction of the metal before such a pocket of gold ore is encountered. Again, the line carrying the gold may be simply a thin seam or film, so that all the gold ore workable with profit may be deposited from solution on a film so thin as to be almost invisible to the naked eye. Sometimes the material of the entire vein is rich enough to pay for the profitable extraction of the metal. This is especially true in some gold mines of British Columbia and Alaska. The ores are more likely to be spotted than otherwise, that is, gold occurs in small pockets rather than with a uniform distribution throughout the entire vein. 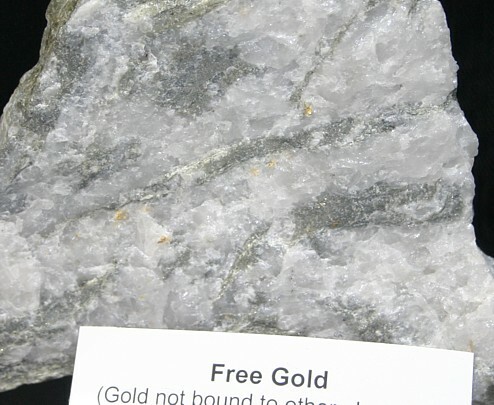 The vast majority of gold deposits within the United States occur in true fissure veins, and while these were historically the most important sources, only a few are still worked. The second type is known as the propylitic in which through the metasomatic alterations of the wall rock there is developed secondary minerals such as chlorite and epidote, the former resulting from the metamorphism of various micas, the latter from the alterations of feldspars. These propylitic types are in close proximity to veins of sericite and kaolin. 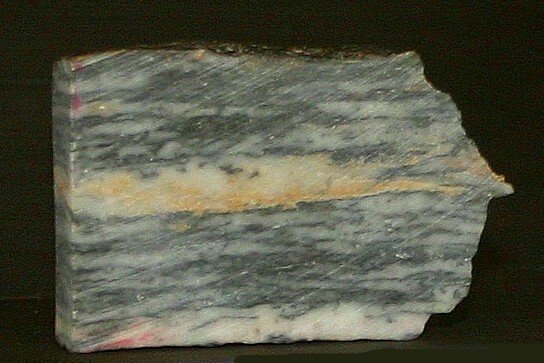 The first type occurring with quartz gangue in true fissure veins is seldom highly argentiferous, the second type in which kaolinization has taken place is often rich in silver content or highly silver-bearing. The character of the rock which the vein traverses is often variable, for the gold-bearing veins appear in either igneous or sedimentary rocks, sometimes at the contact zone between igneous and sedimentary rocks, little influenced by the character of the rock which the vein traverses save in the case of replacement. Again, true fissure veins, in the more recent lava flows, often appear intimately associated with tellurium, and these often give rise to ore pockets of great richness. In the telluride group the ores occur either as definite tellurides of gold with silver, lead and antimony, or as native gold accompanied with various tellurides. The gangue minerals are quartz and fluorite; calcite may be sparingly present. In Boulder County, Colorado, roscoelite, a vanadium mica, is associated with the tellurides. Please note these specimens are not for sale, most are not owned by me. I present this page as a reference, as folks just love to look at real natural beauty and these gold specimens are definitely that. Photographs and text are copyrighted and may not be reproduced without permission.